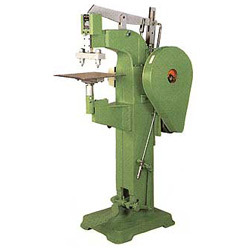 Manufacturer of Various Professional Machinery. Application: particularly suited for riveting leather ring binders. 2. Adjustable spindle distance: 90-280 mm. 3. Throat depth: 300 mm. 4. Rivet holder to floor distance: 1000 mm. 6. Machine dimensions (L x W x H): 900 x 600 x 1480 mm. 7. Net weight: 260 kgs. 8. Gross weight: 340 kgs.